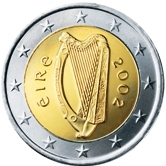 Ireland was one of the founding members of the Euro zone and started issuing coins in 2002. Some basic facts relating to Éire(Ireland). 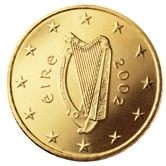 Irish Euro Coins have only one motif for all eight coins - the Celtic harp. 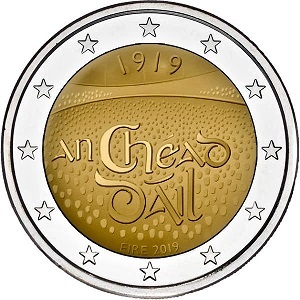 In addition Ireland up to 2018 has only minted one Commemorative Coin of its own. Those of you who have ever been to Ireland will know that it is a land of great national beauty with a rich history - such potential for an interesting set of coins! Dublin alone could supply eight motifs - but no we have only a Celtic harp. 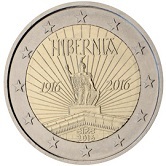 Let us hope that in the future Ireland will draw on its great resources and supply us with some wonderful Two Euro Commemoratives Coins. 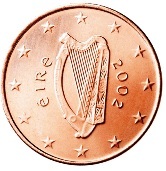 1 cent - Celtic Harp. 2 cent - Celtic Harp. 5 cent - Celtic Harp. 10 cent - Celtic Harp. 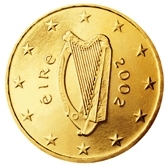 20 cent - Celtic Harp. 50 cent - Celtic Harp. 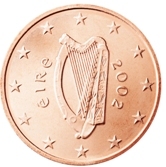 1 Euro - Celtic Harp. 2 Euro - Celtic Harp. 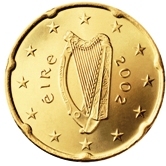 Around the rim of the Two Euro Coin appear the number "2" followed by "**". This is repeated six times so that the "12-Star" European motif is represented. Each "2" is inverted with respect to the preceding and following "2". 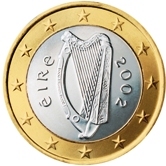 Irish Commemorative Two Euro Coins. 2016 - 100th Anniversary of the Easter Uprising against British rule. 2019 - 100th Anniversary of the first meeting of the "Dail Éireann"(Assembly of Ireland). 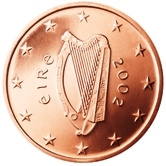 Return from Irish Euro Coins to euro coin collector.